1 What are the kind of products consumers buy with their mobile phone? 2 What de consumers expect from an app? In the last couple months there have been several studies that predicted that the mobile search volume traffic will surpass the volume for desktops in the next 12 months. However, sales and conversions of mobile devices are still not in line with this growth. 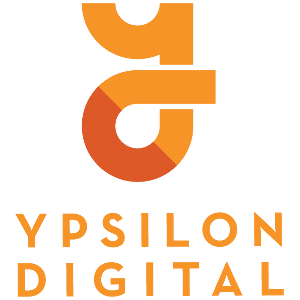 To understand the situation with mobile search, mobile commerce and mobile as a part of a multi-channel strategy, Econsultancy compiled the Mobile Commerce Compendium (n=1000). 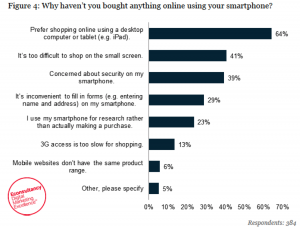 As part of the report Econsultancy examined why consumers refrain from purchasing products with their smartphone. Consumers indicate that they mainly use their smartphone for research and checking prices. They prefer to do the final purchase on a desktop computer or a tablet (64 percent). The second most common reason seem to be the problems with the small screen size (41 percent), while 39 percent say they are concerned about the safety with purchases made on their phone. Interestingly, six percent of respondents still believe that mobile websites do not offer the same as desktop sites. 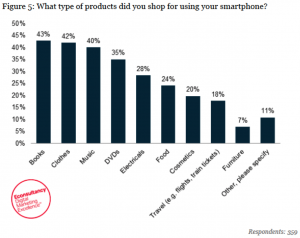 What are the kind of products consumers buy with their mobile phone? The survey results show that about half (49 percent) of respondents made a purchase with their phone in the previous six months. A majority of this group (54 percent) spent a total of no more than 50 pounds sterling (USD $75). This corresponds with the results of another question, which shows that only the cheapest consumer goods are sold through mobile. When looking at what kinds of products are sold the most, books (43 percent) and clothing (42 percent) topped the list, followed closely by music (40 percent) and DVDs (35 percent). The question is whether this is an accurate reflection of mobile shoppers or that it demonstrates the power of Amazon (Mobile). Furniture is one of the least popular product categories on mobile (7 percent). 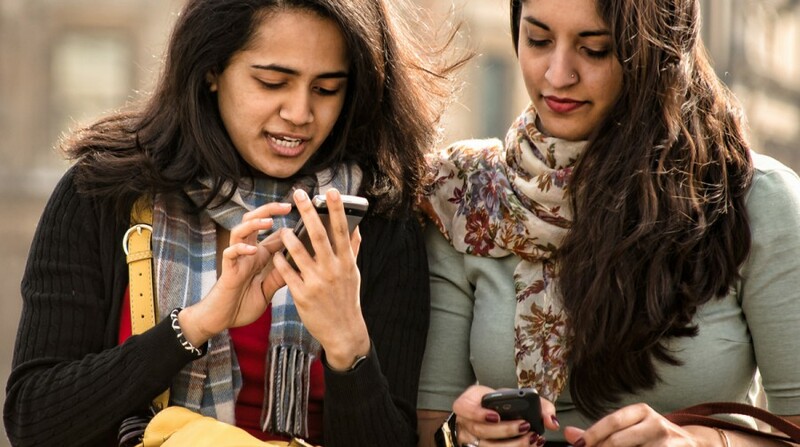 What de consumers expect from an app? 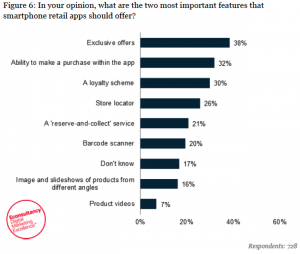 Econsultancy also examined what consumers expect from a mobile shopping application. It is characteristic of the current state of mobile commerce that according to 32 percent of respondents this would be the possibility of in-app purchases. Exclusive Offers (38 percent) headed the list. A loyalty program (30 percent) and a store locator (26 percent) are also frequently mentioned. There are many beautiful e-commerce apps available, but a good mobile site is a must if you want to increase mobile conversions. Mobile sites can be opened on all phones and they’re suitable for mobile search traffic. In addition, it’s easier to share product pages on these sites, and to open them. If you are still going to develop an app, make sure it’s more than a mobile version of your normal site. Do things that you can’t do with a mobile site. One example is the integration of a barcode scanner. Mobile users are often action-oriented, so a search engine is important so users can get where they need to be more quickly. Mobile users expect the same product range as the one on a desktop computer or a laptop. Via desktop, it is also unwise to raise additional barriers, but for mobile this is an absolute no-no. This is perhaps the most important factor and it explains the success of Amazon, for example. Once you have an account it is very easy to buy something. The rule is ultimately very simple, ensure that the absolute minimum of user action is required. Besides that it allows the user to use his favorite payment methods like PayPal, this also lowers the threshold because they will only need to login as a user. Good product filters ensure that the user can quickly and easily pick his/her products and choose what to buy. Mobile users have a smaller screen but this does not mean that they are not tempted by images. After all, this is what makes visual apps like Instagram immensely popular. For Mobile it is even more important that you think carefully about the effectiveness of your photos. Users want immediate information about product availability and shipping, but often these are not directly mentioned on the product pages. Research shows that people decide to stay or leave within a fraction of seconds. A long load time for pages on your mobile site is a recipe for high bounce rates and abandoned shopping carts. This may seem like a big “duh”, but it still happens all too often. Users will always have questions about products or orders. They already have their mobile phone ready, so a quick phone call could help them on their way to complete a sale. If you have a physical store location, make sure you integrate a store locator. Econsultancy’s research shows that this is something that many users expect to find. During the coming years there will still be a large group that will be concerned about safety for purchases on a mobile and therefore do not dare to order. So make sure to provide alternative methods, such as telephone contact, reserve & collect, and saving products in a wish list. This is quite the paradox, but there is a fine line between a simple and clear site and one with little or no functionality. Comparing prices happens a lot online, so you can better facilitate it within your own app or site to avoid people having to compare your products elsewhere (which will probably still happen though). Think of store locators and showing the stock at the nearest branch. It is expected that mobile search traffic next year will be greater than search traffic from desktops. Keep this in mind in your SEO strategy by targeting mobile search terms. This is kind of a no-brainer, but many people still seem to forget this on a product page. Enable the use of the payment address as the shipping address and provide a tool that automatically completes the address. The shorter the steps to complete the purchase, the better. By offering the possibility to pick up products in the physical store, you can persuade offline buyers by reducing the difference between offline/online.